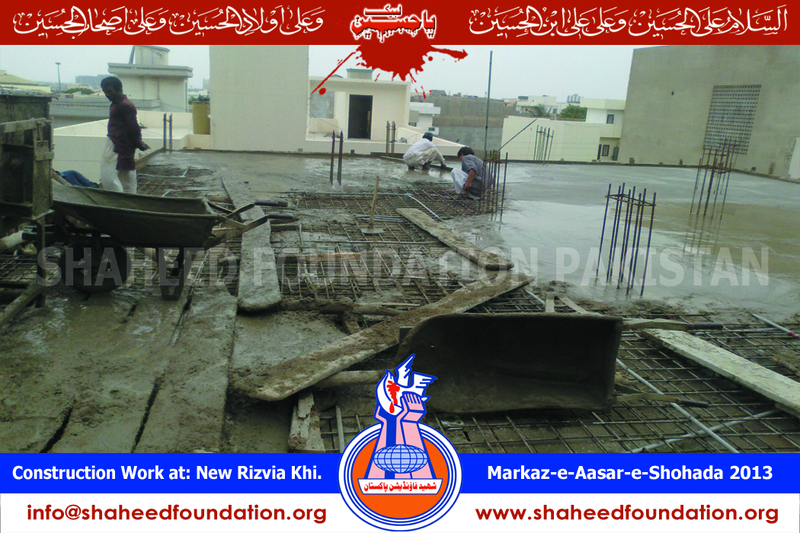 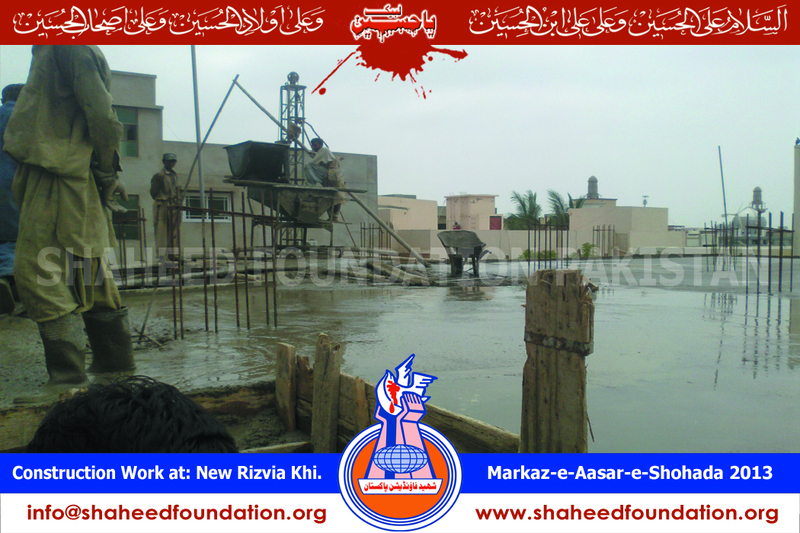 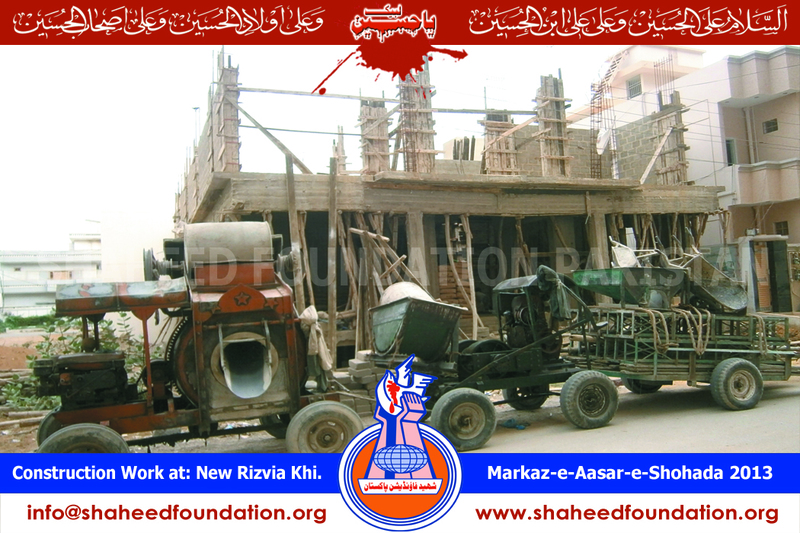 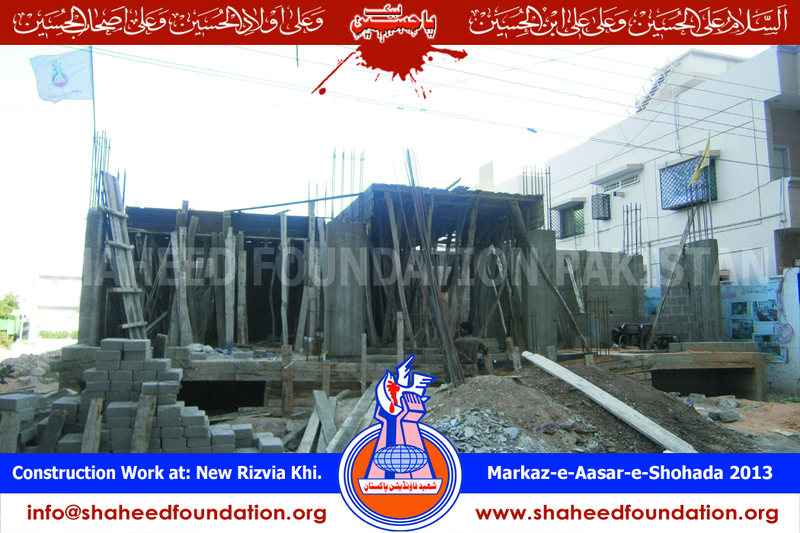 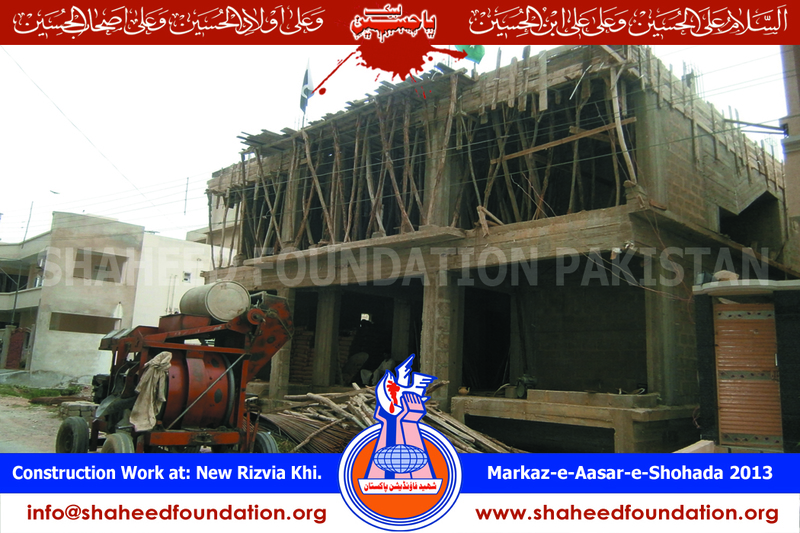 Construction Work Continues @ Markaz Asaar-e-Shohada wa Nigehdaasht-e-Khanwada-e-Shohada. 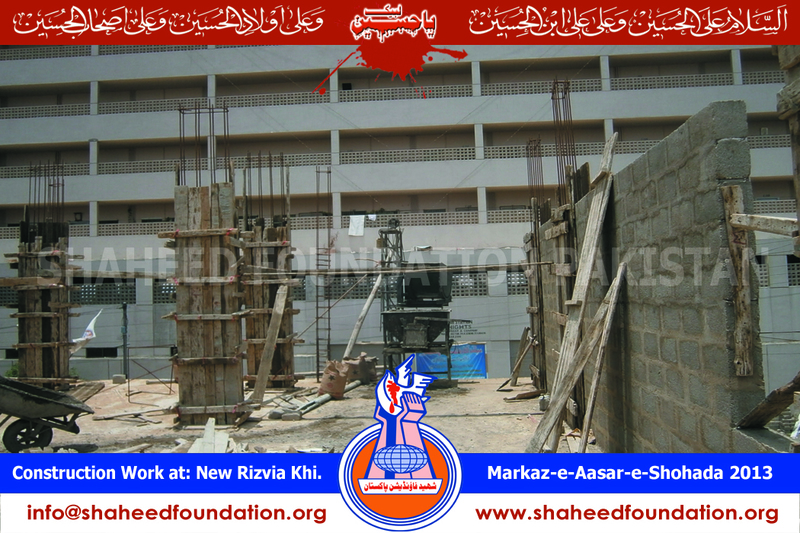 Alhamdulillaah the construction is continuing at a significant pace and this project is expected to be completed approximately in a year. 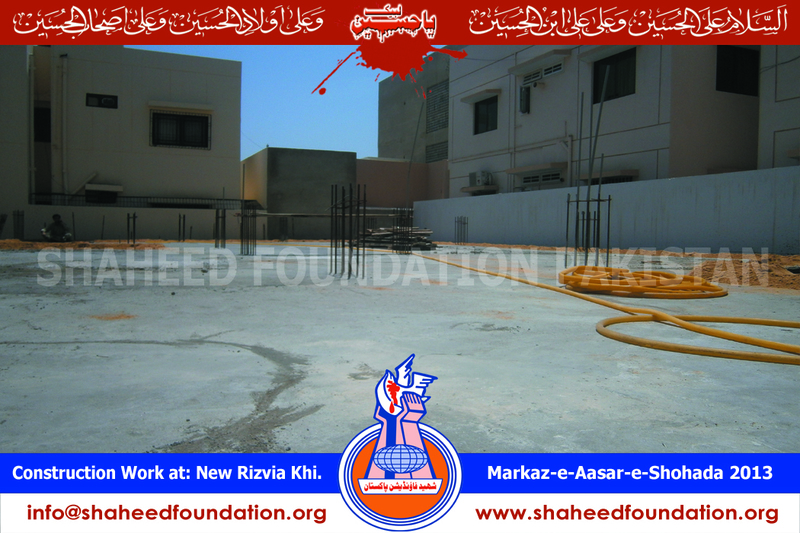 Annexed to Markaz Asaar-e-Shohada Pakistan and Markaz Nigeha`dasht the facility will also houseAl-Shaheed Saqafati Markaz and a Contact office will also be established. 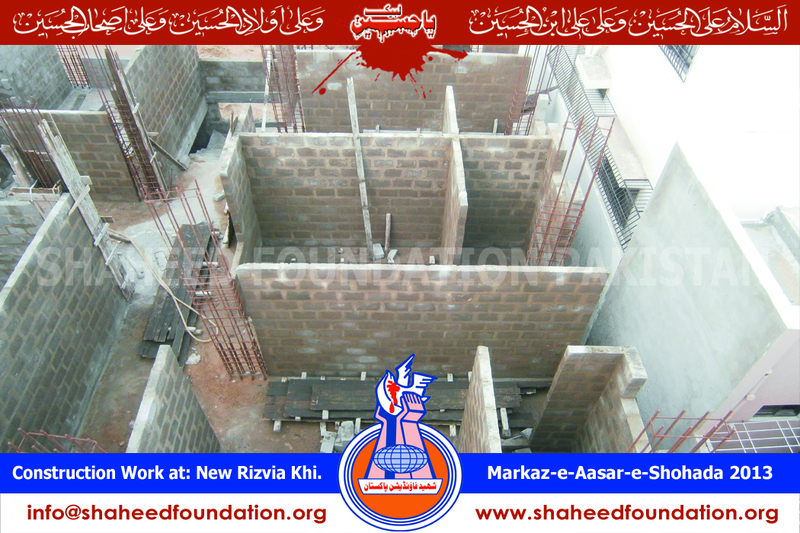 Regular updates, regarding the construction of this project, will be communicated to momineens through several mediums, to encourage Millat-e-Jaffaria Pakistan to step forward and participate generously, as they have always done at every occasion, so as to accomplish this noble cause. 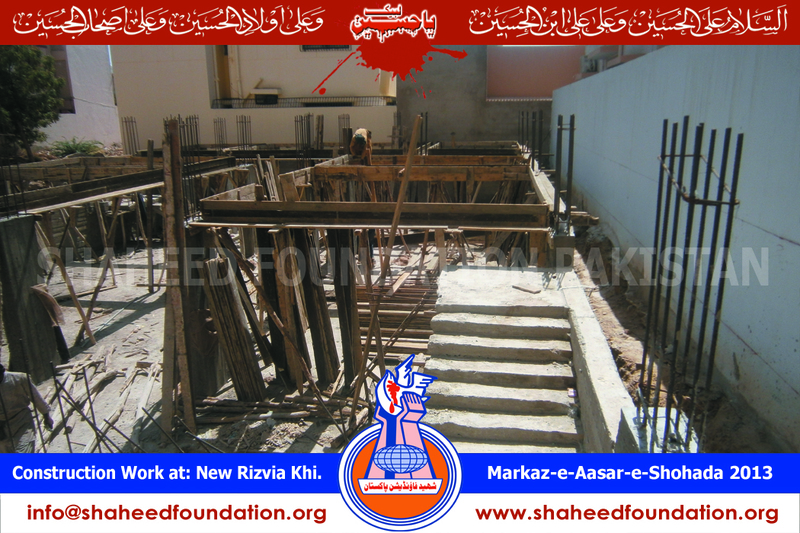 => 22 March 2013: With shuttering woods, structure of pillars/beam was prepared for basement`s roof. 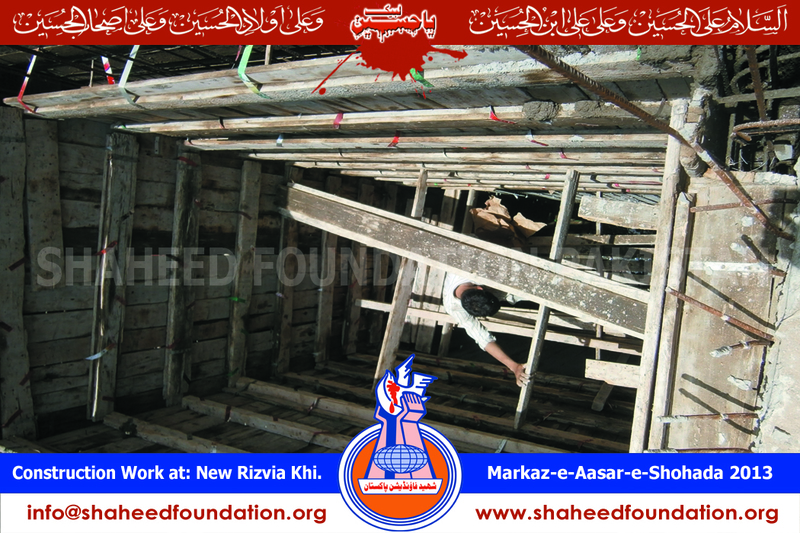 => 4 April 2013: The entire roof's shuttering work was completed. 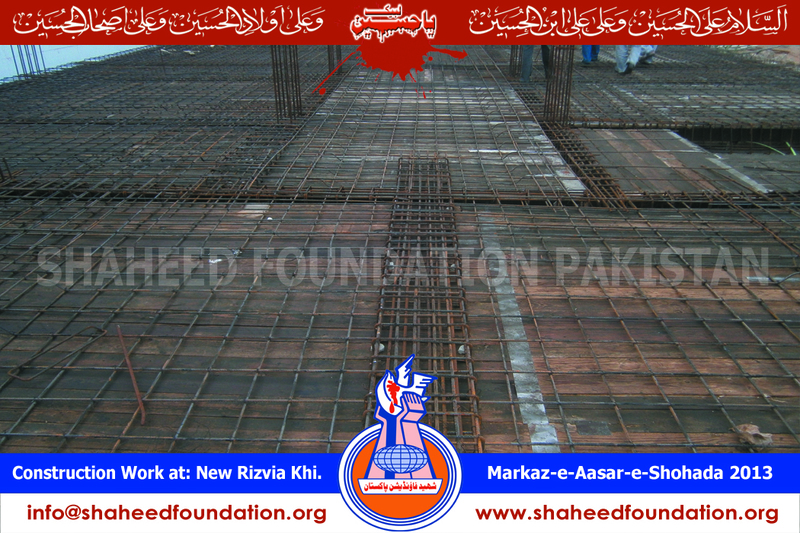 => 7 April 2013: Iron mesh was prepared for pillars/beam. 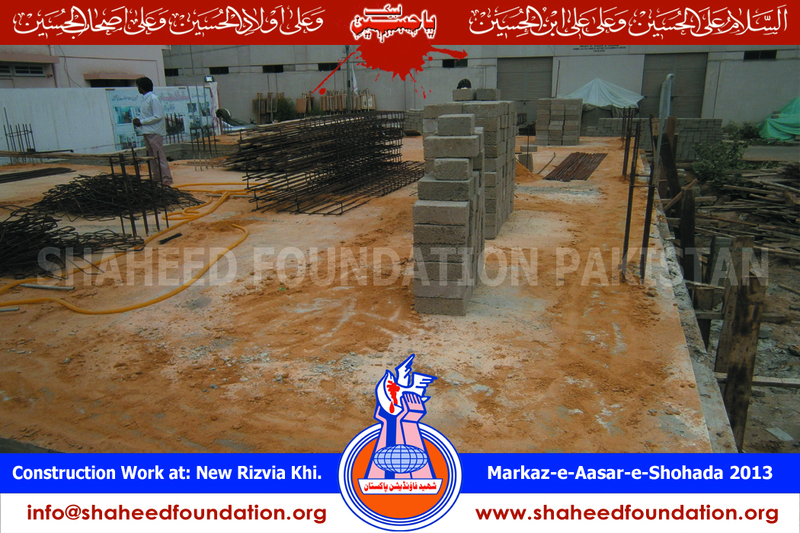 => 13 April 2013: Double mesh of Iron structure work completed. 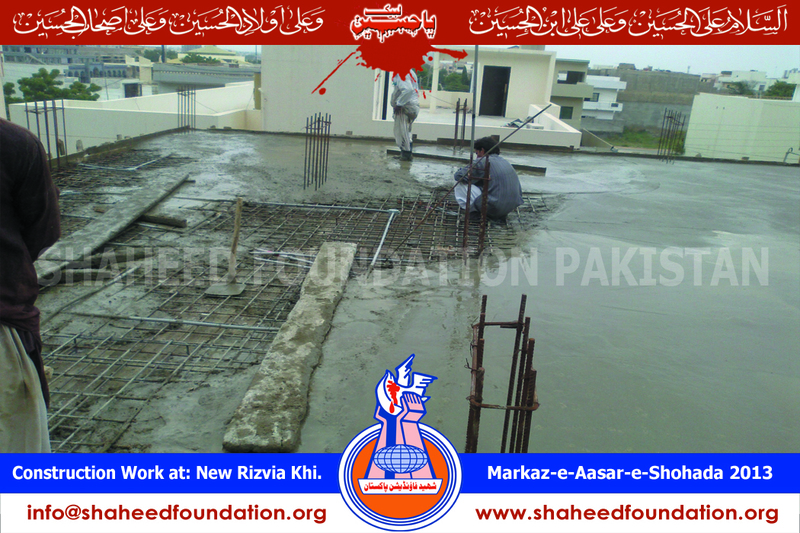 => 13 April 2013: Piping work for Concealed electrical wiring in roof completed. 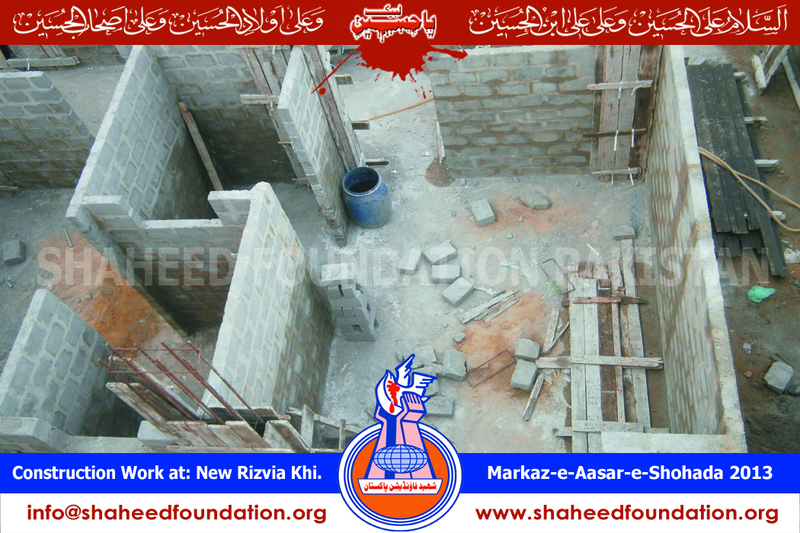 => 14 April 2013: Roof`s filling/masonry work completed. 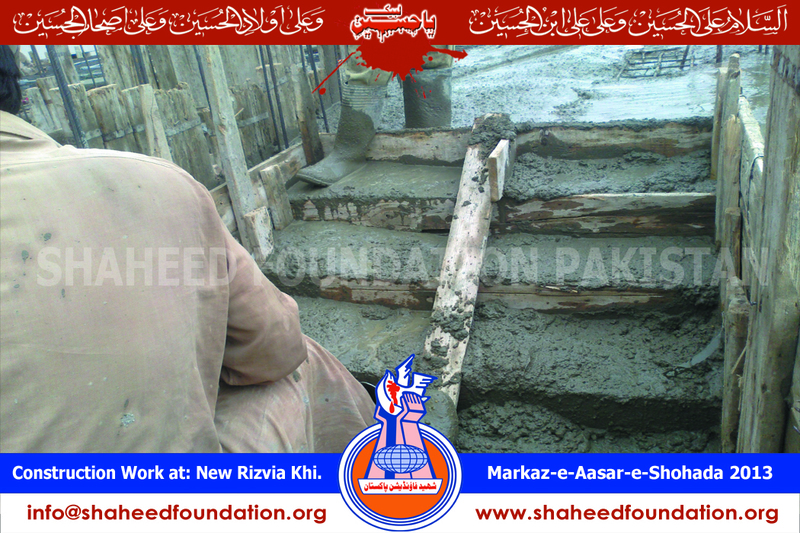 => 6 May 2013: Block work for walls of Ground floor (Markaz-e-Nigeha`dasht) was carried out. 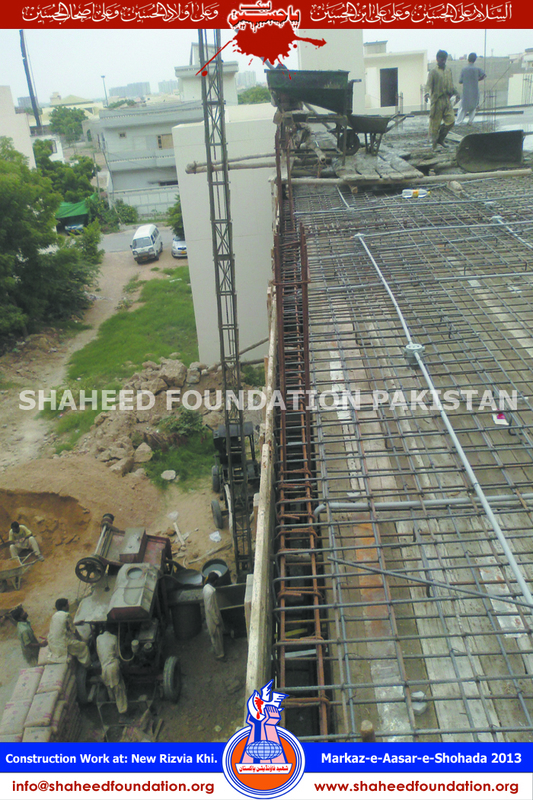 => 12 May 2013: Block work of 4 single bed wards and 4 double bed wards, located at Ground Floor (Markaz-e-Nigeha`dasht) was carried out. 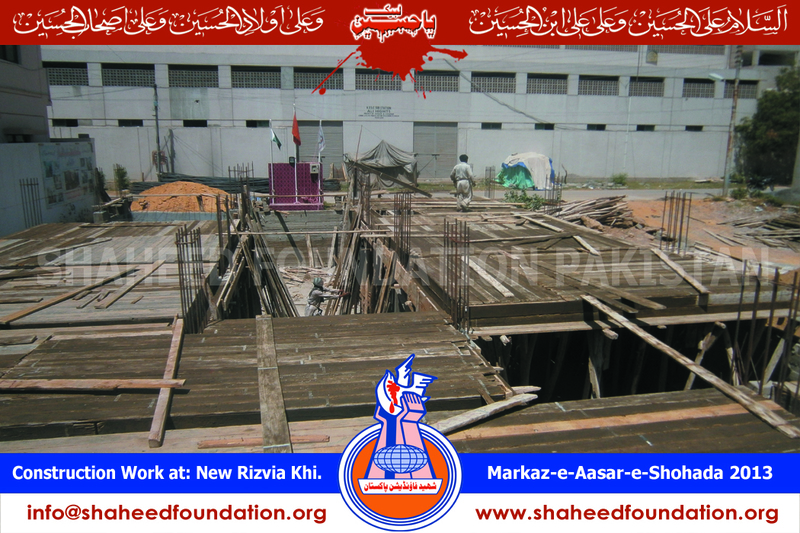 => 18 May 2013: Columns structure work with shuttering wood was completed. 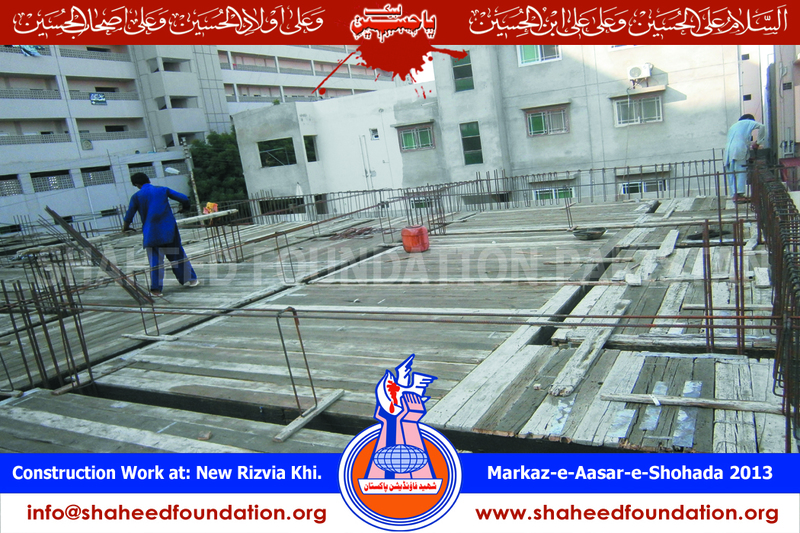 => 24 June 2013: Ground floor`s roof work completed. 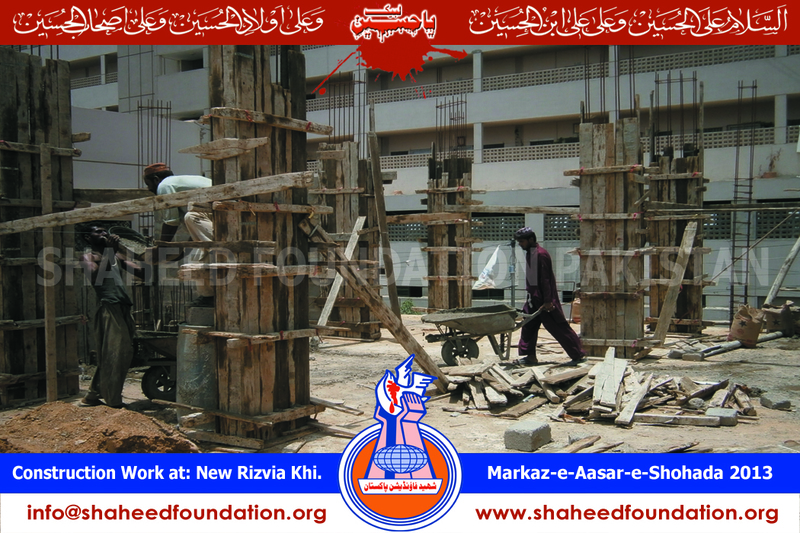 => 17 July 2013: Construction work of columns and elevator case of 1st Floor Markaz-e-Asaar-e-Shohada was completed. 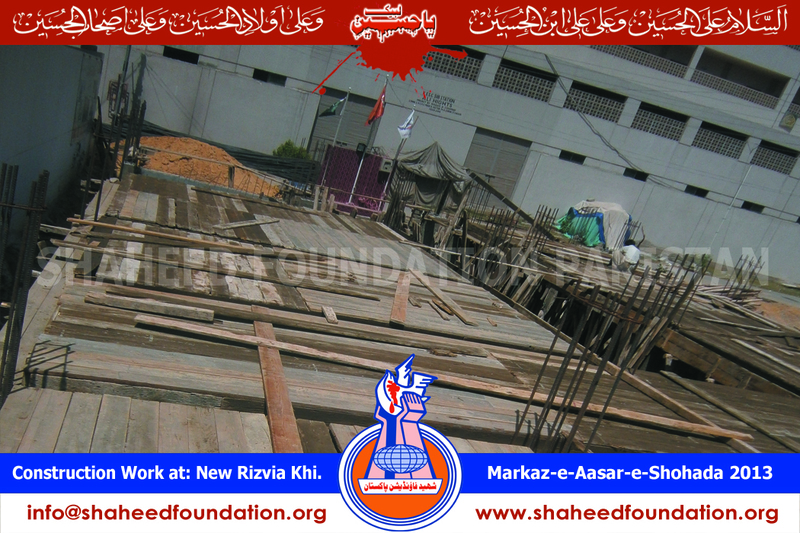 => 18 July 2013: Roof construction work of first floor, Markaz-e-Asaar-e-Shohada, has been started. 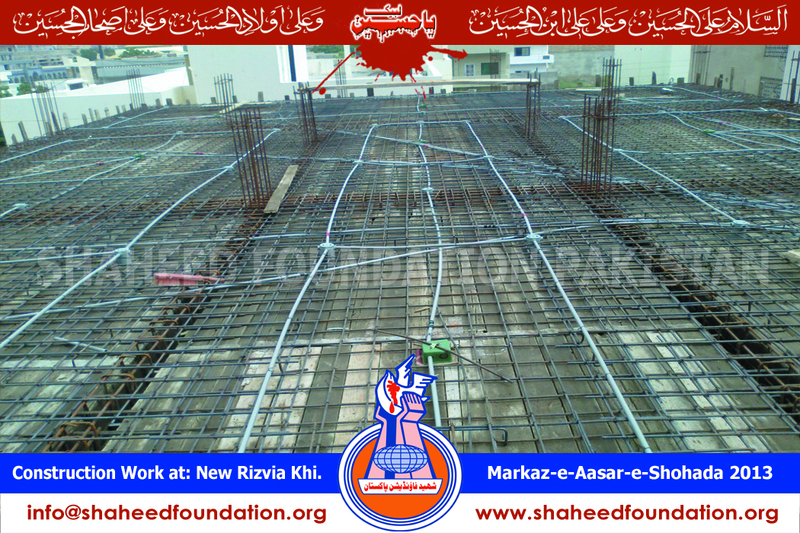 => 1 aug 2013 : Iron mesh was prepared for pillars/beam on first floor. 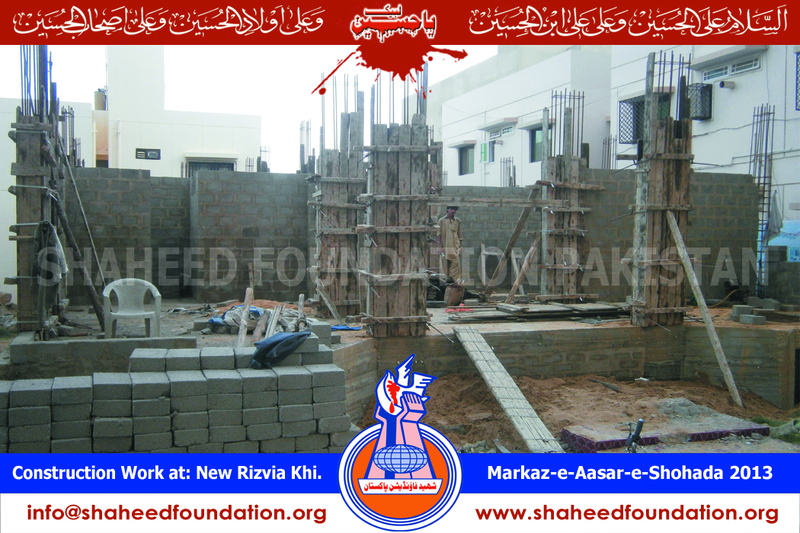 => 25 aug 2013: First floor structure was completed with roof filling. 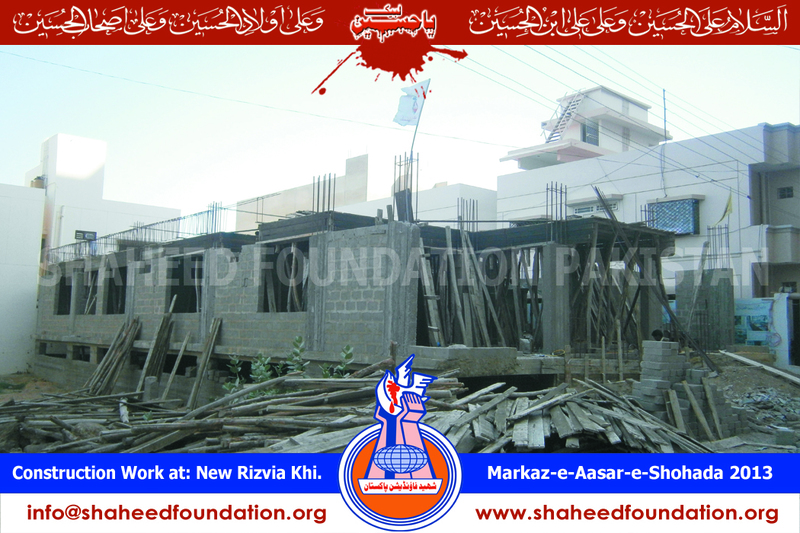 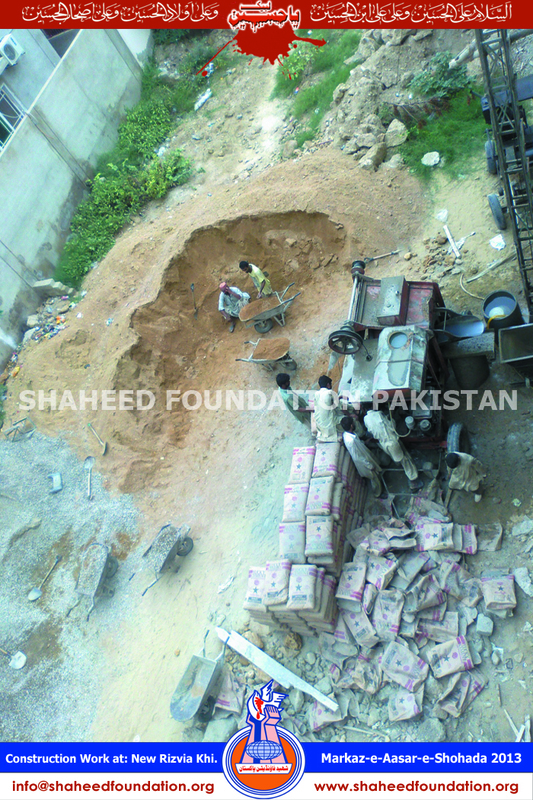 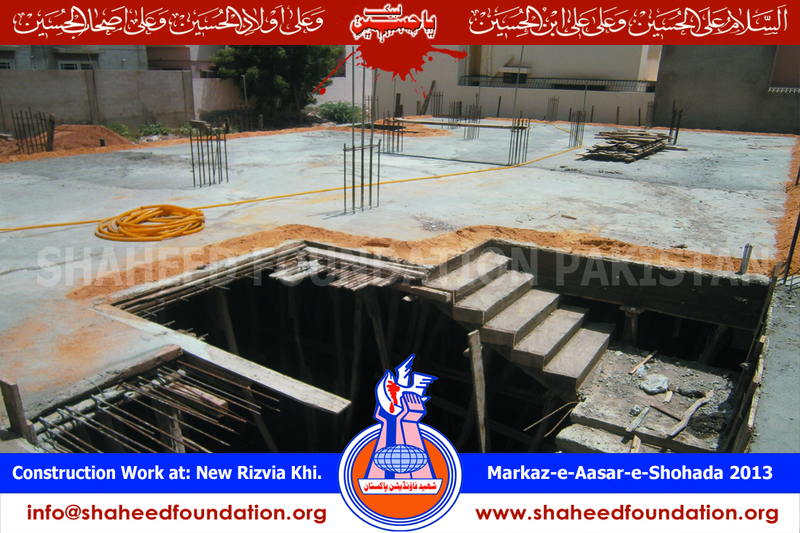 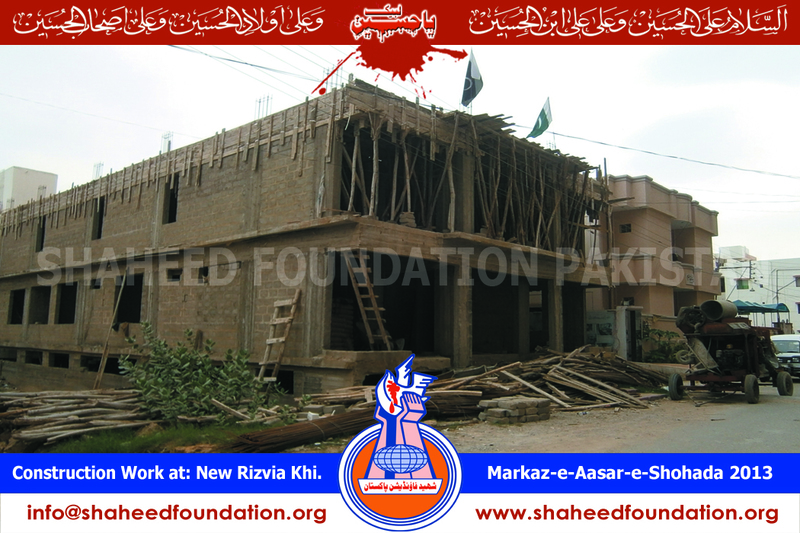 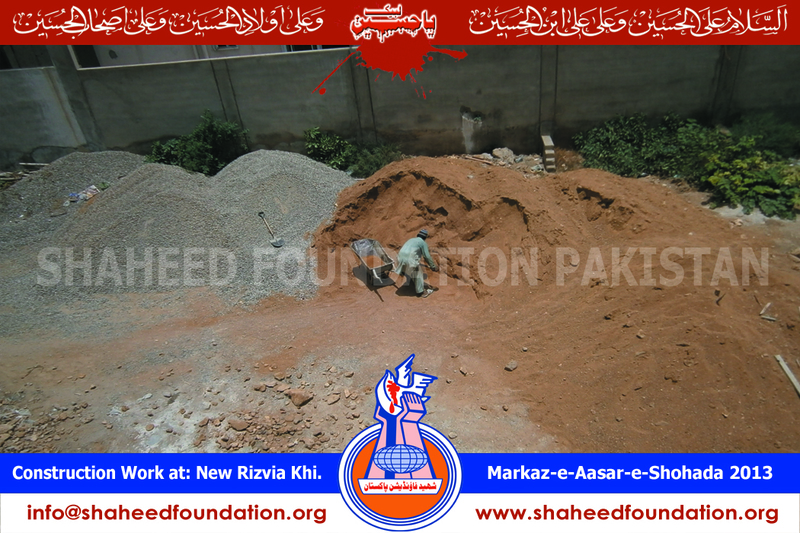 Shaheed Foundation Pakistan will inshallaah continue to update momineens on completion of each phase of this project.